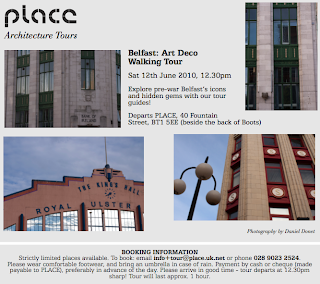 PLACE Blog: Saturday 12th June - Belfast Art Deco tour! Please wear comfortable footwear, and bring an umbrella in case of rain. Payment by cash or cheque (made payable to PLACE), preferably in advance of the day. Please arrive in good time - tour departs at 12.30pm sharp! Tour will last approx. 1 hour. I wish I was in Belfast this Saturday to do this tour. I hope you get heaps of people and it is a huge success and don't forget the elephants on the former Burton's Store in Ann St. They are the best one's I've seen anywhere in the UK.